Fi found this recipe while flicking through Good Housekeeping magazines when we were visiting our parents. The original recipe uses chicken, but we have both been loving turkey at the moment so whenever we make this for dinner we switch the chicken out for turkey steaks instead. The recipe has a lovely creamy sauce and surprisingly it doesn’t use any butter to get it. Genius! 2 turkey steaks pre-cooked – we normally wrap these in foil and put in the oven for about 20 mins. Preheat the oven to 220°C (200°C fan) or Gas Mark 7. Place the sweet potatoes on a baking tray and into the oven. They should take around 40 mins to bake. When the potatoes have 20 mins to go, start making the sauce. Heat the oil over a medium heat, then add the flour and cook for 1 minute. Remove from the heat and gradually add the milk, whisking until fully combined. Put back on the heat and bring to the boil while continually whisking. Simmer for 3 minutes before whisking in the mustard and stirring in the turkey. Cook for a couple of minutes until the turkey is piping hot, then stir in the tarragon and spinach. 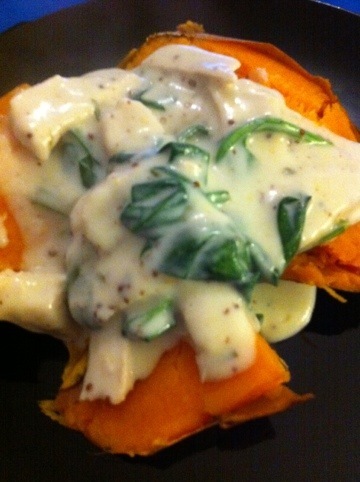 Take the sweet potatoes out of the oven, split them open and spoon on the turkey mixture. We’ve only recently become fans of beans, up until a couple of years ago we both hated them, I think it was something about the texture that freaked us out! Anyway once we’d discovered we actually liked beans we went on the hunt for more recipes and this has quickly become a staple in our house. Not only is it totally delicious but it’s really quick and incredibly cheap to make. So it’s the absolute perfect meal to have mid week, on the lead up to payday! Fry the onions and carrots for 5-8 mins until soft. Sprinkle in the chilli powder and cook for another minute. Add the tomatoes and pulses and bring to the boil. Turn down the heat and simmer for 5-10 mins, stirring occasionally, until the mixture thickens. Spread a spoonful of the bean chilli over a large ovenproof dish. Fill each wrap with a few tbsp of chilli mixture and roll up. Place into the ovenproof dish. Spoon the remaining chilli on top and sprinkle with the grated cheese. Grill or bake for a few mins until the top is golden and bubbling. Enjoy with some salad or just by itself, delicious!